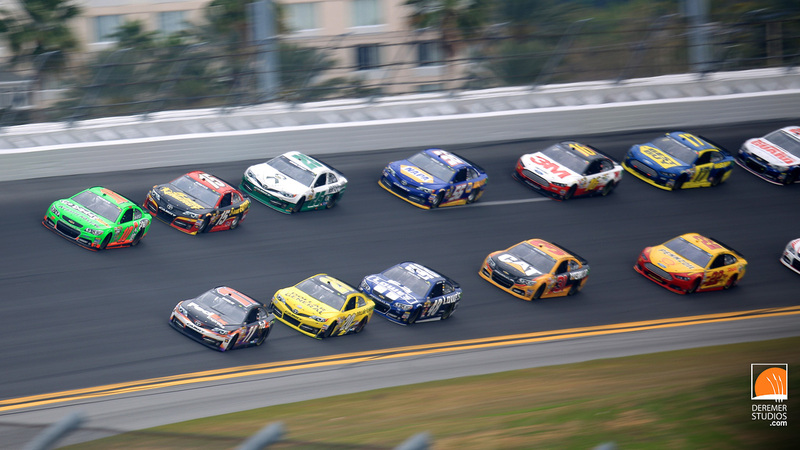 Yesterday, we had the pleasure of once again going down to Daytona for the annual running of the Daytona 500. One of the first things you notice is that you’re surrounded by people with cameras – from fellow professionals, to the masses of spectators with their own SLRs, point and shoots, and cell phones. And so, the challenge becomes, how do you capture unique photos when everyone is photographing the same thing? 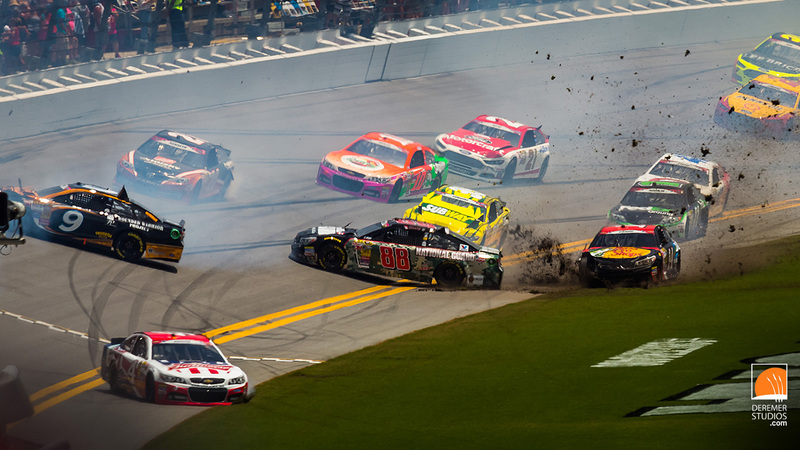 Sure getting those split second shots of a wreck and the significant moments of the race, like Danica Patrick becoming the first woman to take pole in any NASCAR race, and also becoming the first woman to lead a lap (below) are important. Those are all good, noteworthy photos that tell the story of the race, but with thousands or event staff and hundreds of thousands in attendance, there are lots of other stories as well. The big headline of the race was certainly Danica’s pole position and a genuinely top-shelf performance throughout the race. 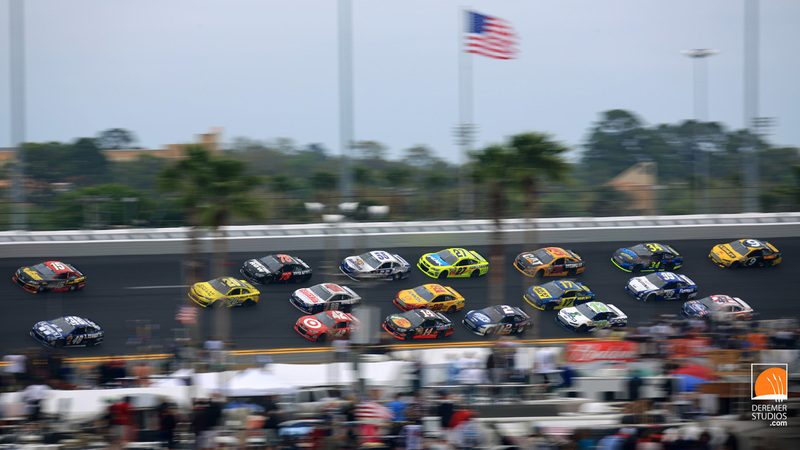 Other notable subjects included the issues with Toyota’s powerplant and of course, the injured spectators from the Nationwide race were still weighing heavily on the drivers. 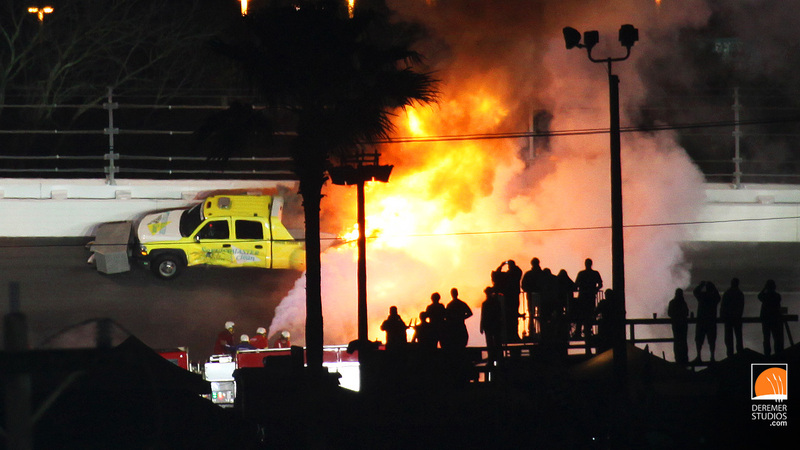 Thankfully there was no incident with a Jet Dryer as with last year (see our coverage of the dramatic explosion here), but there was still plenty of news to go around! But now, onto some of the micro-stories of the event. For example, despite the previous day’s graphic illustration of why standing up against the fence is a bad idea, the annual battle between spectators and the fence guards went on as if nothing had happened. 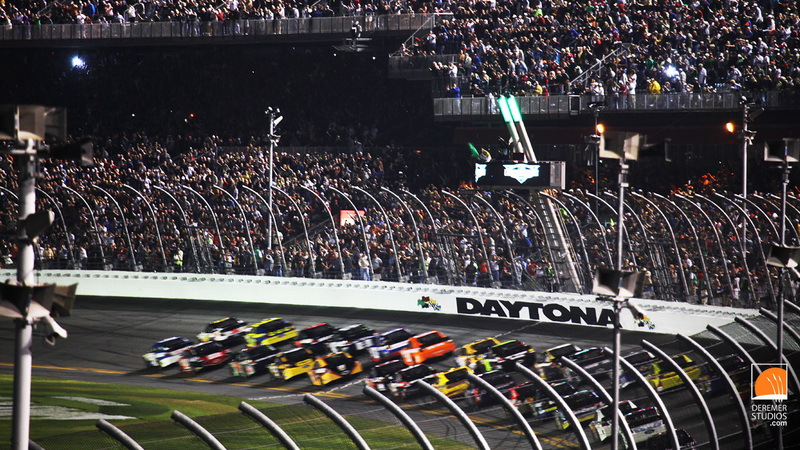 One such incident that kept replaying time and again, almost every lap, was the site of countless hats being blown off of race fans’ heads as they walked as close to the fence as possible with the cars speeding by at over 200MPH (you can see the photo of one close save in the slideshow below). Another piece or the race day experience that rarely goes noted is the work of all the folks behind the scenes. One person that especially caught my eye was the technician who ran the half mile long camera dolly suspended 100 feet above the track (above). Several times during the race, I noticed him in an insanely tall cherry picker, fiddling with the rig, making sure it would be ready for the next pass. 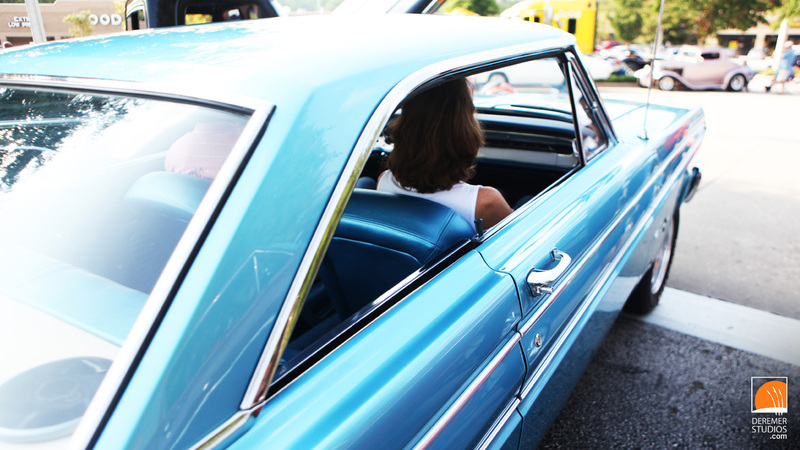 To quote our friends at Top Gear, “and on that bombshell”, enjoy the photos! 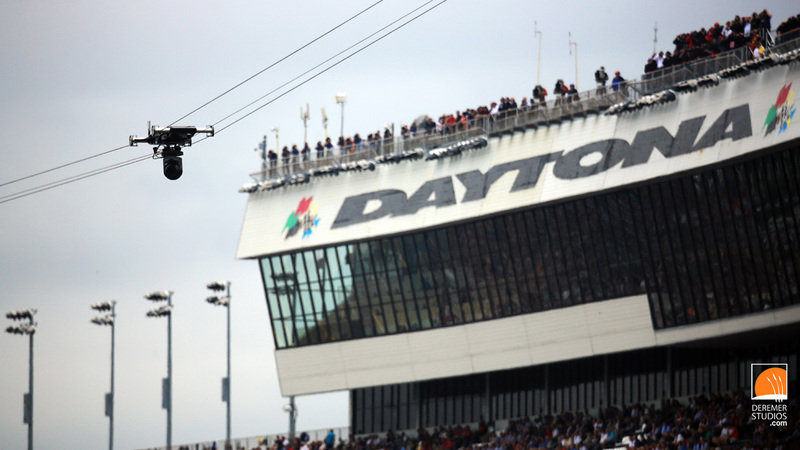 As you can see from the photo above, we had quite an adventure shooting the Daytona 500 last night! 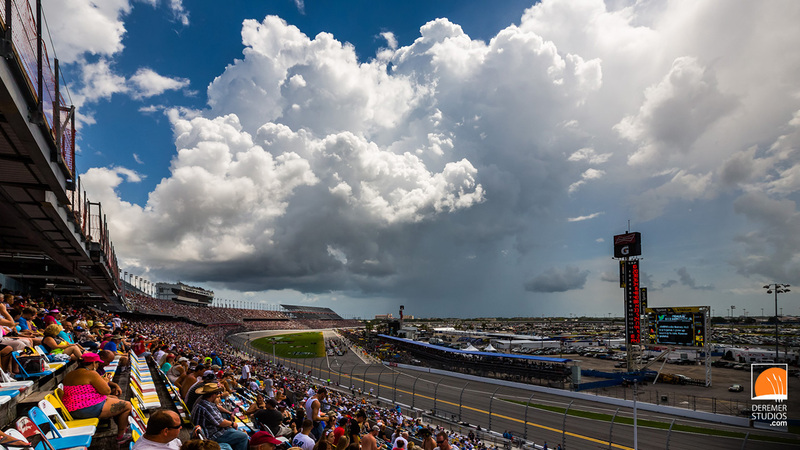 The race, which was delayed over 30 hours due to rain (the first time in its 54 year history the race was not run on Sunday), was marked by events that could have been straight out of the grainy, black and white world of the Twilight Zone. At lap 160, while the caution was out, the 42 Target car was on the back stretch catching up to the pack. 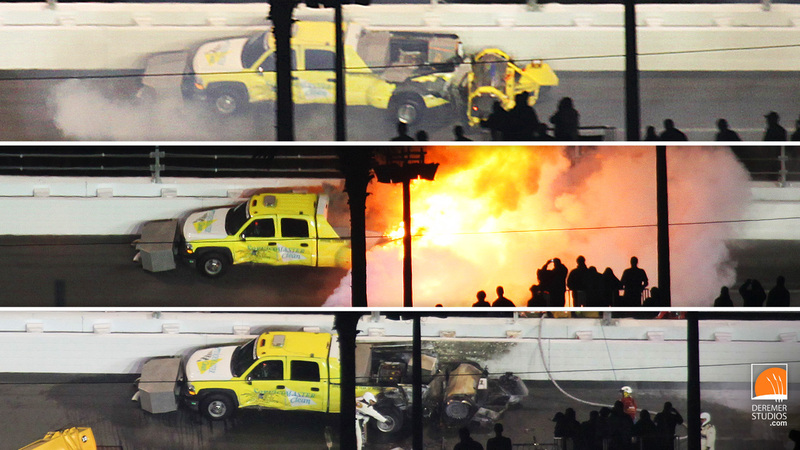 Just before entering turn 3, something broke in the rear of the car, sending it spinning out of control – and directly toward one of the jet dryer trucks that was slowly circling the track. I just happened to be looking in that direction, and saw a massive fireball erupt as the two vehicles met. I quickly grabbed my 100-400 and took the following series of images. The first is just a second or two after impact, before the jet fuel ignited. As you can see, the damage doesn’t look all that severer. The second image is shortly after the fire crew arrived. The third image is after the fire has been put out – you can clearly see the destruction. Below are my favorite photos from this very unique race! All the photos can be downloaded for free as HD desktop wallpaper. Simply click on a photo below, click on the permalink (bottom right), save the HD wallpaper by right clicking the “1280×720” link, and selecting save as.